Style, finish, functionality, and hygiene are important considerations when selecting kitchen or bath sink faucets. The right sink faucets can easily upgrade a kitchen, bath or shower. Just Manufacturing kitchen sink faucets and drains are specifically designed for the needs of the serious culinary enthusiast including demanding family environments around the house. Our lavatory/bathroom faucets and shower trim sets are available in multiple configurations and styles to meet the needs of your bathroom project or remodel. 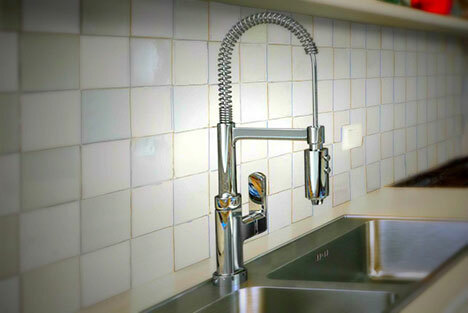 Faucets along with sinks are the most used items in the kitchen work triangle. Washing, dish rinsing together with food prep are all part of daily uses. Ergonomics, aesthetics, engineered functionality including finishes all factor into Just kitchen faucets quality, as well as durability. Browse Just’s unique expansive line of Faucets for Kitchen, Bath & Utility applications. Most models are available in Brushed Nickel or Polished chrome finish. We offer a variety of single or two handle faucets, as well as a wide-range of designs, from modern low-profile lines to classic-inspired design flair. Use the links on the right to browse Just’s extensive line of kitchen sink faucets ….check out the great selection of drains too!